Launched in 1933, the 303 had been the first bmw six-cylinder, with a displacement of only 1175 cc. From april of 1934, the 303 was replaced by the 315, with the engine increased in capacity to 1.5 litres, and distinguished more its flexibility and responsiveness than outright performance. But bmw had a natural inclination towards sporting cars and later that year unveiled a sporting derivative of its small six: The 3151. Top speed of 74 mph engine typedrivetrain: Water-cooled, overhead-valve, 6-cylinder displacement 1,490 cc (1.49 l) power rating 40 hp transmission 4-speed manual chassis: Tubular-steel; Front independent suspension by transverse leaf spring and upper link arms; Rear suspension by semielliptic leaf springs; 4-wheel drum brakes; 2,508 lbs. Neat roadster bodywork the chassis of the 315 was relatively short for a four-seat sedan; But it was ideal for the neat roadster body designed for the 3151 by the bmw factory stylist peter schimanowski. Its modern lines were something new for a sports car, the clientele for which has sometimes been accused of being traditionalist in its outlook. precise steering under the hood, the 3151 differed from the 315 in having three carburetors instead of two, plus a compression ratio raised from 5.6:1 to 6.8:1, which gave a 17.5 percent increase in the 315s modest power output of 34 hp. With its rigid chassis, precise rack-and-pinion steering and independent front suspension, the 3151 was a revolution in sports car design. A works team won the 1.5-litre class in the 1934 international tour alpine trial. 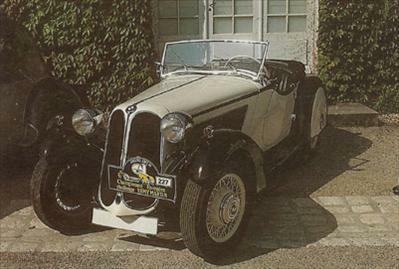 Some models of the car were marketed in england as the frazer nash-bmw.